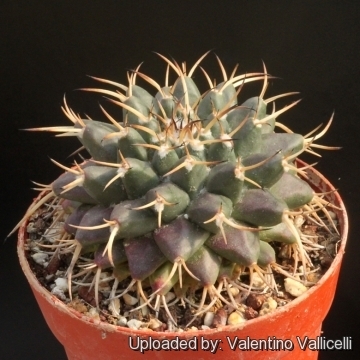 The spines are of variable shape and length, occasionally they are very long (up to 5 cm long). Origin and Habitat: This species is widespread throughout central Mexico in Hidalgo, Guerrero, Jalisco, México State, Aguascalientes, Tlaxcala, Veracruz, Zacatecas, Queretaro, Guanajuato, Hidalgo, Tamaulipas, Nuevo Leon, Puebla, San Luis Potosi, and México Federal District. Populations of this species are relatively numerous and abundant. Altitude: 100-2,700 metres above sea level. Habitat and ecology: It grows in dry rocky places in the open or (mainly) in xerophyllous vegetation. Despite the great abundance and diversity of cacti in Mexico, Mammillaria magnimamma is one of the few cacti species that has colonized barren lava fields. In parts of its range the species is threatened by local extraction for ornamental plant trade and by the expansion of urbanized areas. 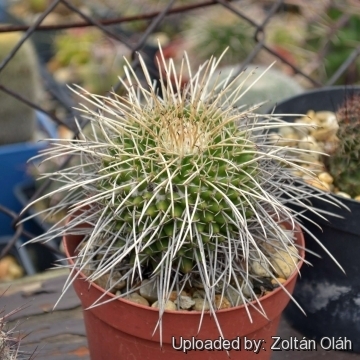 Description: Mammillaria magnimamma is a perennial stem succulent solitary at first, later branching basally (or dichotomously) to form large mounds up to 50 cm in diameter (or more) barely rising above ground level. This species is very variable and has received many names. 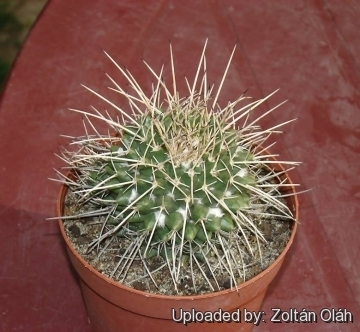 In particular the spines are of variable shape and length, occasionally they are very long (up to 5 cm long). Stems: Flattened globose to globose, grey-green to dark blue-green, 10-13 cm in diameter and up to 30 cm tall. Tubercles: Conic-pyramidal as long or longer than broad, about 10 mm tall, firm, four-sided but not sharply angled, with latex, flowering axils with dense white wool, especially when young. Radial: (1-)2-5(-6), sometimes more, extremely variable, unequal, awl shaped, whitish to yellowish, with dark tips, 3-45 mm long, lower one longer up to 5 cm long, stronger than the others and more or less curving downward. Flowers: Dirty white, creamy-yellow or tinged brown with reddish midveins, to deep purplish pink, 20-25 mm wide and long and in diameter. Fruits: Club shaped, dark purplish red, to 20 mm long, sticking straight out from the stem. 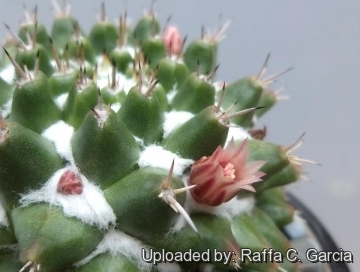 10) Curt Backeberg: “Die Cactaceae: Handbuch der Kakteenkunde” Volume V, Gustav Fischer Verlag, Stuttgart New York 1982–1985, page. 3131f. 11) Curt Backeberg, Frederik Marcus Knuth: “Kaktus-ABC: En haandbog for fagfolk og amatører.” Kopenhagen 1936, page. 400. 14) Cházaro, M., Hernández, H.M., Gómez-Hinostrosa, C., Guadalupe Martínez, J. & Sánchez , E. 2013. 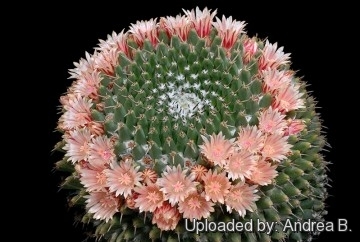 Mammillaria magnimamma. The IUCN Red List of Threatened Species. Version 2014.3. <www.iucnredlist.org>. Downloaded on 01 February 2015. 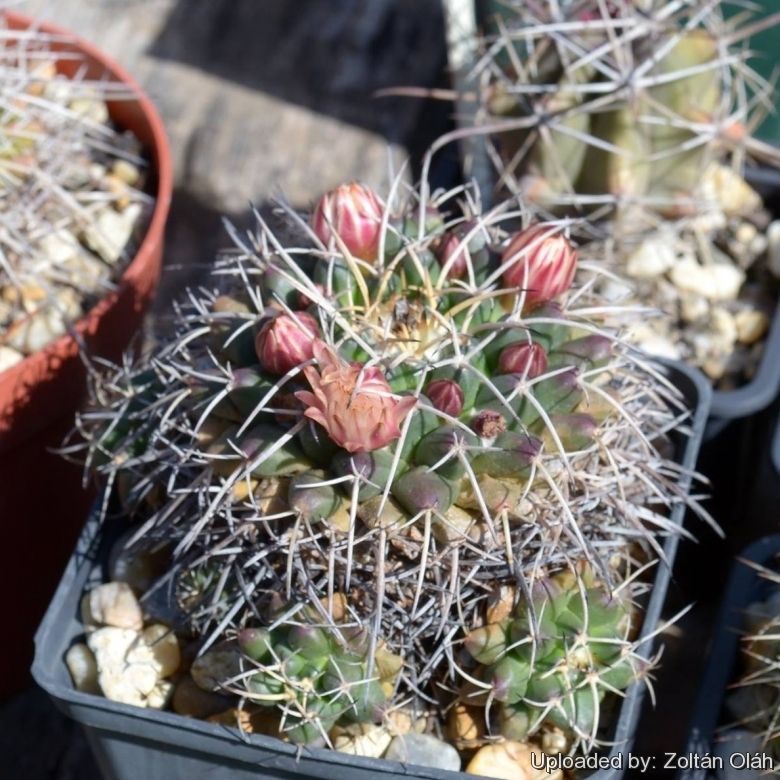 Mammillaria magnimamma Photo by: Andrea B.
Cultivation and Propagation: Mammillaria magnimamma is easy to cultivate, and makes an interesting specimens. Over time it will produce large clumps. It grows by producing offsets, and also by dichotomously dividing and doesn't require any special treatment, but needs as much light as possible without burning the plant, to keep the stems compact. During the summer it is best to keep the plants outside where the temperature can rise to over 30° C with no harm to the plant, recommended for any collection that needs lots of light with ample airflow.